* Christopher Chase-Dunn is a Distinguished Professor of Sociology and Director of the Institute for Research on World-Systems at the University of California, Riverside. He is the author of Rise and Demise: Comparing World-Systems (with Thomas D. Hall), The Wintu and Their Neighbors (with Kelly Mann) and The Spiral of Capitalism and Socialism (with Terry Boswell). He is the founder and former editor of the Journal of World-Systems Research. Chase-Dunn is currently doing research on global party formation and antisystemic social movements. He also studies the rise and fall of settlements and polities since the Stone Age and global state formation.Recent research focuses on the causes of scale changes in the sizes of polities and settlements and the evolution of global governance and the global political economy. In order to perceive major transformations in the logic of social change it is necessary to adopt an anthropological framework that compares small-scale human societies with larger and more complex societies that have emerged and that compares complex civilizations with one another and studies their interlinkages. The World Studies Interdisciplinary Project at the University of Massachusetts-Amherst is providing a venue in which humanists and social scientists can use their skills to develop more sophisticated perspectives on the processes of development and social change that have occurred over the past 50,000 years. Much of recent thinking about long-term social change has been premised on the rejection of functionalism. The evolutionary structural-functionalism of Talcott Parsons (1966; 1971) was vague and implied that the Harvard Faculty Club, like earlier English redoubts at Oxford and Cambridge, was the highest form of human civilization. The United States, with its relatively autonomous educational, economic, political and religious institutions, was the most institutionally differentiated modern society, and this fit Parsons’s definition of evolution as increasing differentiation and autonomy of institutional domains. An entire generation of critics rejected this as just another instance of the use of evolutionary theory to prop up the claims of superiority by the powerful, as it had done for the British Empire in the 19th century. But the idea of evolution can be applied without any assumptions about superiority or progress. The scientific study of patterned change and of the emergence of complexity, differentiation and hierarchy within and between human societies does not require assumptions about either progress or regress. It is not necessary to assume that complexity or hierarchies are superior to simplicity or equality in order to study these patterns and their causes. Functionalism too, need not be thrown out once it is cleansed of non-scientific assumptions and selection mechanisms have been explicitly identified (Turner 2010). For example, the insight that powerful elites often act to increase their rewards and to maintain their privileges should not preclude us from recognizing that some institutionalized inequalities may be functional for non-elites as well as for elites. Complex and differentiated polities require integration and leadership in order to meet both internal and external challenges. The combination of the functional and conflict theories of stratification leads to the supposition that there is an optimal level of inequality for allowing polities to coordinate their activities and to meet challenges and that inequality beyond that optimal level is probably due to the action of elites who are using their advantages to exploit and dominate non-elites. Hall and Chase-Dunn (2006; see also Chase-Dunn and Hall 1997) have modified the concepts developed by the scholars of the modern world-system to construct a theoretical perspective for comparing the modern system with earlier regional world-systems. The main idea is that sociocultural evolution can only be explained if polities are seen to have been in important interaction with each other since the Paleolithic Age. Hall and Chase-Dunn propose a general model of the continuing causes of the evolution of technology and hierarchy within polities and in linked systems of polities (world-systems). This is called the iteration model and it is driven by population pressures interacting with environmental degradation and interpolity conflict. This iteration model depicts basic causal forces that were operating in the Stone Age and that continue to operate in the contemporary global system (see also Chase-Dunn and Hall 1997: Chapter 6; Fletcher et al 2011). These are the continuities. The most important idea that comes out of this theoretical perspective is that transformational changes in institutions, social structures and developmental logics are brought about mainly by the actions of individuals and organizations within polities that are semiperipheral relative to the other polities in the same system. This is known as the hypothesis of semiperipheral development. As regional world-systems became spatially larger and the polities within them grew and became more internally hierarchical, interpolity relations also became more hierarchical because new means of extracting resources from distant peoples were invented. Thus did core/periphery hierarchies emerge. Semiperipherality is the position of some of the polities in a core/periphery hierarchy. Some of the polities that are located in semiperipheral positions became the agents that formed larger chiefdoms, states and empires by means of conquest (semiperipheral marcher polities), and some specialized trading states in between the tributary empires promoted production for exchange in the regions in which they operated. So both the spatial and demographic scale of political organization and the spatial scale of trade networks were expanded by semiperipheral polities, eventually leading to the global system in which we now live. The modern world-system came into being when a formerly peripheral and then semiperipheral region (Europe) developed an internal core of capitalist states that were eventually able to dominate the polities of all the other regions of the Earth. This Europe-centered system was the first one in which capitalism became the predominant mode of accumulation, though semiperipheral capitalist city-states had existed since the Bronze Age in the spaces between the tributary empires. The Europe-centered system expanded in a series of waves of colonization and incorporation (See Figure 1 below). Commodification in Europe expanded, evolved and deepened in waves since the thirteenth century, which is why historians disagree about when capitalism became the predominant mode. Since the fifteenth century the modern system has seen four periods of hegemony in which leadership in the development of capitalism was taken to new levels. The first such period was led by a coalition between Genoese finance capitalists and the Portuguese crown (Wallerstein 2011; Arrighi, 1994). After that the hegemons have been single nation-states: the Dutch in the seventeenth century, the British in the nineteenth century and the United States in the twentieth century (Wallerstein, 1984a). Europe itself, and all four of the modern hegemons, were former semiperipheries that first rose to core status and then to hegemony. In between these periods of hegemony were periods of hegemonic rivalry in which several contenders strove for global power. The core of the modern world-system has remained multicentric, meaning that a number of sovereign states ally and compete with one another. Earlier regional world-systems sometimes experienced a period of core-wide empire in which a single empire became so large that there were no serious contenders for predominance. This did not happen in the modern world-system until the United States became the single super-power following the demise of the Soviet Union in 1989. The sequence of hegemonies can be understood as the evolution of global governance in the modern system. The interstate system as institutionalized at the Treaty of Westphalia in 1644 is still a fundamental institutional structure of the polity of the modern system. The system of theoretically sovereign states was expanded to include the peripheral regions in two large waves of decolonization (see Figure 1), eventually resulting in a situation in which the whole modern system became composed of sovereign national states. East Asia was incorporated into this system in the nineteenth century, though aspects of the earlier East Asian tribute-trade state system were not completely obliterated by that incorporation (Hamashita, 2003). Each of the hegemonies was larger as a proportion of the whole system than the earlier one had been. And each developed the institutions of economic and political-military control by which it led the larger system such that capitalism increasingly deepened its penetration of all the areas of the Earth. And after the Napoleonic Wars in which Britain finally defeated its main competitor, France, global political institutions began to emerge over the tops of the international system of national states. The first proto-world-government was the Concert of Europe, a fragile flower that wilted when its main proponents, Britain and the Austro-Hungarian Empire, disagreed about how to handle the world revolution of 1848. The Concert was followed by the League of Nations and then by the United Nations and the Bretton Woods international financial institutions (The World Bank, the International Monetary Fund and eventually the World Trade Organization). The political globalization evident in the trajectory of global governance evolved because the “powers that be” were in heavy contention with one another for geopolitical power and for economic resources, but also because resistance emerged within the polities of the core and in the regions of the non-core. The series of hegemonies, waves of colonial expansion and decolonization and the emergence of a proto-world-state occurred as the global elites tried to compete with one another and to contain resistance from below. I have already mentioned the waves of decolonization. Other important forces of resistance were slave revolts, the labor movement, the extension of citizenship to men of no property, the women’s movement, and other associated rebellions and social movements. These movements affected the evolution of global governance in part because the rebellions often clustered together in time, forming what have been called “world revolutions” (Arrighi et al., 1989). The Protestant Reformation in Europe was an early instance that played a huge role in the rise of the Dutch hegemony. The French Revolution of 1789 was linked in time with the American and Haitian revolts. The 1848 rebellion in Europe was both synchronous with the Taiping Rebellion in China and was linked with it by the diffusion of ideas, as it was also linked with the emergent Christian Sects in the United States. 1917 was the year of the Bolsheviks in Russia, but also the same decade saw the Chinese Nationalist revolt, the Mexican Revolution, the Arab Revolt and the General Strike in Seattle led by the Industrial Workers of the World in the United States. 1968 was a revolt of students in the U.S., Europe, Latin America and Red Guards in China. 1989 was mainly in the Soviet Union and Eastern Europe, but important lessons about the value of civil rights beyond justification for capitalist democracy were learned by an emergent global civil society. The current world revolution of 20xx (Chase-Dunn and Niemeyer, 2009) will be discussed as the global countermovement in this paper. The big idea here is that the evolution of capitalism and of global governance is importantly a response to resistance and rebellions from below. This has been true in the past and is likely to continue to be true in the future. Boswell and Chase-Dunn (2000) contend that capitalism and socialism have dialectically interacted with one another in a positive feedback loop similar to a spiral. Labor and socialist movements were obviously a reaction to capitalist industrialization, but also the U.S. hegemony and the post-World War II global institutions were importantly spurred on by the World Revolution of 1917 and the waves of decolonization. So what does the comparative and evolutionary world-systems perspective tell us about continuities and transformations of systemic logic? Are recent developments just another bout of financial expansion and collapse and hegemonic decline? Or do they constitute or portend a deep structural crisis in the capitalist mode of accumulation? What do recent events signify about the evolution of capitalism and its possible transformation into a different mode of accumulation? From the perspective of the last 50,000 years the big news is demographic and ecological. After slowly expanding, with cyclical ups and downs in particular regions, for millennia the human population went into a steep upward surge in the last two centuries. Humans have been degrading the environment locally and regionally since they began the intensive use of natural resources. But in the last 200 years of industrial production ecological degradation by means of resource depletion and pollution has become global in scope, with global warming as the biggest consequence. A demographic transition to an equilibrium population size began in the industrialized core countries in the nineteenth century and has spread unevenly to the non-core in the twentieth century. Public health measures have lowered the mortality rate and the education and employment of women outside of the home is lowering the fertility rate. But the total number of humans is likely to keep increasing for several more decades. In the year 2000 there were about six billion humans on Earth. But the time the population stops climbing it will be 8, 10 or 12 billion. This population big bang was made possible by industrialization and the vastly expanded use of non-renewable fossil fuels. Fossil fuels are captured ancient sunlight that took millions of years to accrete as plants and forests grew, died and were compressed into oil and coal. The arrival of peak oil production is near and energy prices will almost surely rise again after a long fall. The recent financial meltdown is related to these long-run changes in the sense that it was brought on partly by sectors of the global elite trying to protect their privileges and wealth by seeking greater control over natural resources and by over-expanding the financial sector. But non-elites are also implicated. The housing expansion, suburbanization, and larger houses with fewer people in them have been important mechanisms, especially in the United States, for incorporating some of the non-elites into the hegemonic globalization project of corporate capitalism. The culture of consumerism has become strongly ensconced both for those who actually have expanded consumption and as a strong aspiration for those who hope to increase their consumption to the levels of the core. The main significance of the 5,000-year time horizon is to point us to the rise and decline of modes of accumulation. The story here is that small-scale human polities were integrated primarily by normative structures institutionalized as kinship relations—the so-called kinship-based modes of accumulation. The family was the economy and the polity, and the family was organized as a moral order of obligations that allowed social labor to be mobilized and coordinated, and that regulated distribution. Kin-based accumulation was based on shared languages and meaning systems, consensus-building through oral communication, and institutionalized reciprocity in sharing and exchange. As kin-based polities got larger they increasingly fought with one another and polities that developed institutionalized inequalities had selection advantages over those that did not. Kinship itself became hierarchical within chiefdoms, taking the form of ranked lineages or conical clans. Social movements using religious discourses have been important forces of social change for millennia. Kin-based societies often responded to population pressures on resources by “hiving-off” -- a subgroup would emigrate, usually after formulating grievances in terms of violations of the moral order. Migrations were mainly responses to local resource stress caused by population growth and competition for resources. When new unoccupied or only lightly occupied but resource-rich lands were reachable the humans moved on, eventually populating all the continents except Antarctica. Once the land was filled up a situation of “circumscription” raised the level of conflict within and between polities, producing a demographic regulator (Fletcher et al 2011). In these circumstances technological and organization innovations were stimulated and successful new strategies were strongly selected by interpolity competition, leading to the emergence of complexity, hierarchy and new logics of social reproduction. Around five thousand years ago the first early states and cities emerged in Mesopotamia over the tops of the kin-based institutions. This was the beginning of the tributary modes of accumulation in which state power (legitimate coercion) became the main organizer of the economy, the mobilizer of labor and the accumulator of wealth and power. Similar innovations occurred largely independently in Egypt, the Yellow (Huang-Ho) river valley, the Indus river valley, and later in Mesoamerica and the Andes. The tributary modes of production evolved as states and empires became larger and as the techniques of imperialism, allowing the exploitation of distant resources, were improved. This was mainly the work of semiperipheral marcher states (Alvarez et al 2011) Aspects of the tributary modes (taxation, tribute-gathering, accumulation by dispossession) are still with us, but they have been largely subsumed and made subservient to the logic of capitalist accumulation. Crises and countermovements were often involved in the wars and conquests that brought about social change and evolution of the tributary modes. A tributary mode became predominant in the Mesopotamian world-system in the early Bronze Age (around 3000 BCE). The East Asian regional world-system was still predominantly tributary in the nineteenth century CE. That is nearly a 5,000-year run. The kin-based mode lasted even longer. All human groups were organized around different versions of the kin-based modes in the Paleolithic, and indeed since human culture first emerged with language. If we date the beginning of the end of the kin-based modes at the coming to predominance of the tributary mode in Mesopotamia (3000 BCE) this first qualitative change in the basic logic of social reproduction took more than 100,000 years. This brings us to the capitalist mode, here defined as based on the accumulation of profits returning to commodity production rather than taxation or tribute. As I have already said, early forms of capitalism emerged in the Bronze Age in the form of small semiperipheral states that specialized in trade and the production of commodities. But it was not until the fifteenth century that this form of accumulation became predominant in a regional world-system (Europe and its colonies). Capitalism was born in the semiperiphery but in Europe it moved to the core, and the forereachers that further evolved capitalism were former semiperipheral polities that rose to hegemony. Economic crises and world revolutions have been important elements in the evolution of capitalism and global governance institutions for centuries. Thus, in comparison with the earlier modes, capitalism is yet young. It has been around for millennia, but it has been predominate in a world-system for less than a millennium. On the other hand, many have observed that social change in general has speeded up. The rise of tribute-taking based on institutionalized coercion took more than 100,000 years. Capitalism itself speeds up social change because it revolutionizes technology so quickly that other institutions are brought along, and people have become adjusted to more rapid reconfigurations of culture and institutions. So it is plausible that the contradictions of capitalism may lead it to reach its limits much faster than the kin-based and tributary modes did. For Immanuel Wallerstein (2011 ), capitalism started in the long sixteenth century (1450- 1640), grew larger in a series of cycles and upward trends, and is now nearing “asymptotes” (ceilings) as some of its trends create problems that it cannot solve. Thus, for Wallerstein the world-system became capitalist and then it expanded until it became completely global, and now it is coming to face a big crisis because certain long-term trends cannot be accommodated within the logic of capitalism (Wallerstein, 2003). Wallerstein’s evolutionary transformations come at the beginning and at the end. In there is a focus on expansion and deepening as well as cycles and trends, but no periodization of world-system evolutionary stages of capitalism (Chase-Dunn 1998: Chapter 3). . This is very different from both Arrighi’s depiction of successive (and overlapping) systemic cycles of accumulation and from the older Marxist stage theories of national development. Wallerstein’s emphasis is on the emergence and demise of “historical systems” with capitalism defined as “ceaseless accumulation.” Some of the actors change positions but the system is basically the same as it gets larger. Its internal contradictions will eventually reach limits, and these limits are thought to be approaching within the next five decades. Wallerstein sees recent losses by labor unions and the poor as temporary. He assumes that workers will eventually figure out how to protect themselves against globalized market forces and the “race to the bottom”. This may underestimate somewhat the difficulties of mobilizing effective labor organization in the era of globalized capitalism, but he is probably right in the long run. Global unions and political parties could give workers effective instruments for protecting their wages and working conditions from exploitation by global corporations if the North/South issues that divide workers could be overcome. Wallerstein is intentionally vague about the organizational nature new system that will replace capitalism (as was Marx) except that he is certain that it will no longer be capitalism. He sees the declining hegemony of the United States and the crisis of neoliberal global capitalism as strong signs that capitalism can no longer adjust to its systemic contradictions. He contends that world history has now entered a period of chaotic and unpredictable historical transformation. Out of this period of chaos a new and qualitatively different non-capitalist system will emerge. It might be an authoritarian (tributary) global state that preserves the privileges of the global elite or it could be an egalitarian system in which non-profit institutions serve communities (Wallerstein, 1998). Giovanni Arrighi’s (1994) evolutionary account of “systemic cycles of accumulation” has solved some of the problems of Wallerstein’s notion that world capitalism started in the long sixteenth century and then went through repetitive cycles and trends. Arrighi’s account is explicitly evolutionary, but rather than positing “stages of capitalism” and looking for each country to go through them (as most of the older Marxists did), he posits somewhat overlapping global cycles of accumulation in which finance capital and state power take on new forms and increasingly penetrate the whole system. This was a big improvement over both Wallerstein’s world cycles and trends and the traditional Marxist national stages of capitalism approach. Arrighi’s (1994, 2006) “systemic cycles of accumulation” are more different from one another than are Wallerstein’s cycles of expansion and contraction and upward secular trends. 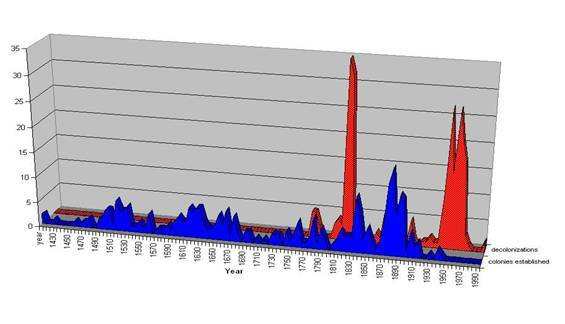 And Arrighi (2006) has made more out of the differences between the current period of U.S. hegemonic decline and the decades at the end of the nineteenth century and the early twentieth century when British hegemony was declining. The emphasis is less on the beginning and the end of the capitalist world-system and more on the evolution of new institutional forms of accumulation and the increasing incorporation of modes of control into the logic of capitalism. Arrighi (2006), taking a cue from Andre Gunder Frank (1998), saw the rise of China as portending a new systemic cycle of accumulation in which “market society” will eventually come to replace rapacious finance capital as the leading institutional form in the next phase of world history. Arrighi does not discuss the end of capitalism and the emergence of another basic logic of social reproduction and accumulation. His anslysis is more in line with the “types of capitalism” and “multiple modernities” literature except that he is analyzing the whole system rather than separate national societies. Arrighi sees the development of market society in China as a consequence of the differences between the East Asian and Europe-centered systems before their merger in the 19th century, and as an outcome of the Chinese Revolution. His discussion of Adam Smith’s notions of societal control over finance capital is interesting, but he is vague as what the forces that can counter-balance the power of finance capital. In China it is obviously the Communist Party and the new class of technocratic mandarins. This is somewhat similar in form to Peter Evans’s discussion of the importance of technocrats in Brazilian, Japanese and Korean national development, though Arrighi does not say so. Arrighi also provides a more explicit analysis of how the current world situation is similar to and different from the period of declining British hegemonic power before World War I ( see summary in Chase-Dunn and Lawrence 2011:147-151). Wallerstein’s version is more apocalyptic and more millenarian. The old world is ending. The new world is beginning. In the coming systemic bifurcation what people do may be prefigurative and causal of the world to come. Wallerstein agrees with the analysis proposed by the students of the New Left in 1968 (and large numbers of activists in the current global justice movement) that the tactic of taking state power has been shown to be futile because of the disappointing outcomes of the World Revolution of 1917 and the decolonization movements. Both a new stage of capitalism and a qualitative systemic transformation are possible within the next three decades, but a new stage of capitalism is more likely. The evolution of global governance occurs when enlightened conservatives implement the demands of an earlier world revolution in order to reduce the pressures from below that are brought to bear in a current world revolution. I think that the most likely outcome of the current crisis and world revolution will be some form of global Keynesianism in which part of the global elite forms a more legitimate and democratic set of global governance institutions to deal with some of the problems of the 21st century. If U.S. hegemonic decline is slow, as it has been up to the present, and if financial and ecological crises are spread out in time and conflicts between ethnic groups and nations are also spread out in time and space then the enlightened progressives will have a chance to build another world order that is still capitalist but meets the current challenges at least partially. But if the perfect storm of calamities should all come together in the same period the transnational social movements and progressive national regimes in the Global South will have the chance to radically change the mode of accumulation to a form of global socialism. Amin, Samir. 1997. Capitalism in an Age of Globalization. London: Zed Books. Arrighi, Giovanni. 1994 The Long Twentieth Century. London: Verso. ——, Terence K. Hopkins, and Immanuel Wallerstein. 1989. Antisystemic Movements. London: Verso. —— and Beverly Silver. 1999. Chaos and Governance in the Modern World-System: Comparing Hegemonic Transitions. Minneapolis: University of Minnesota Press. Boswell, Terry and Christopher Chase-Dunn 2000 The Spiral of Capitalism and Socialism: Toward Global Democracy. Boulder, CO.: Lynne Rienner. Chase-Dunn, C. Yukio Kawano and Benjamin Brewer 2000 “Trade globalization since 1795: waves of integration in the world-system” American Sociological Review 65, 1: 77-95. Doyle, Laura Forthcoming “Inter-imperiality: dialectics in post-colonial world history” Interventions. Henige, David P. 1970 Colonial Governors from the Fifteenth Century to the Present. Madison, WI. : University of Wisconsin Press. Lawrence, Kirk. 2009 “Toward a democratic and collectively rational global commonwealth: semiperipheral transformation in a post-peak world-system” in Phoebe Moore and L Owen Worth, Globalization and the Semiperiphery: New York: Palgrave MacMillan. Lindholm, Charles and Jose Pedro Zuquete 2010 The Struggle for the World: Liberation Movements for the 21st Century. Palo Alto, CA: Stanford University Press. Silver, Beverly J. 2003 Forces of Labor: Workers Movements and Globalization Since 1870. Cambridge: Cambridge University Press. Turchin, P. 2003. Historical dynamics: why states rise and fall. Princeton University Press, Princeton, NJ. Wallerstein, Immanuel. 1984 “The three instances of hegemony in the history of the capitalist world-economy.” Pp. 100-108 in Gerhard Lenski (ed.) Current Issues and Research in Macrosociology, International Studies in Sociology and Social Anthropology, Vol. 37. Leiden: E.J. Brill. Turchin and Nefadov (2009) also emphasize that elite overexpansion is an important part of the demographic secular cycle within polities. Elite overexpansion regularly occurs beyond the carrying capacity of the environment and the system of production.